This chicken was one of those dishes that I read about and immediately think, “Mmmmm” and add the ingredients to the shopping list. It’s yucky and rainy and cold in Cleveland and roast chicken is such a lovely, warming comfort food. This chicken was absolutely delicious – as you can see from the pictures, it was falling off the bone to the point where we couldn’t remove it from the cooking vessel without losing a wing and the leg. It had a delicate sweetness from the orange and brown sugar with a nice smokey flavor from the coffee. It sounds like a strange combination at first glance, but I promise you the orange, coffee, milk, and cloves were a winning combination. This varies slightly from my standard roast chicken because it is braised in the brine liquid and milk rather than roasted at high heat followed by a lower temperature. The salad was simple but delicious. The pickled carrots, which Zak made, were absolutely the star of the salad. 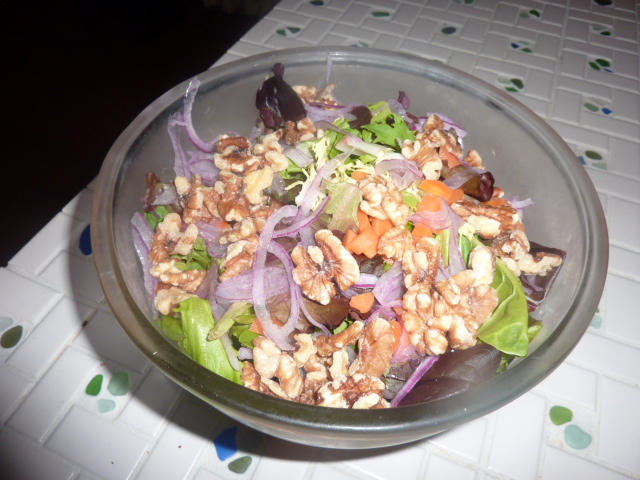 They lent a really delicious crunch to the salad that paired well with the spring greens. The chicken and salad together made up the perfect meal. To begin, in a medium or large saucepan heat water. A little at a time, add kosher salt and sugar while whisking until dissolved. It may be necessary to add more water to the saucepan in order to dissolve all of the salt and sugar. Once the salt and sugar are dissolved, transfer the water to a container large enough to hold the brining solution and chicken. This can be done in a large ziplock bag, though I prefer to use a large stock pot. Add all other brine ingredients and allow brining solution to cool to room temperature, placing solution in refrigerator for 15-20 minutes if necessary. Once the solution is room temperature or cool to the touch, add the chicken to the solution. Place the chicken in the refrigerator and let soak in brining solution about one hour per pound (round up to the nearest hour). Remove chicken from brining solution by straining through a colander. Reserve one cup of brining liquid. Make sure you save all brining ingredients. Dress the chicken with oranges, garlic, cloves, juniper berries, and the bay leaf. Allow the chicken to rest overnight, at least 18 hours. This allows most of the moisture to evaporate from the skin of the chicken, which will result in a crispier skin (my favorite part!). Rub chicken all over with brown sugar. Heat olive oil over medium heat in a Dutch oven. Add two minced garlic cloves and 2 bay leaves. Add chicken and brown 6-8 minutes per side until light golden brown. Add milk and reserved brining liquid, cover, and transfer to oven. Roast chicken roughly 20 minutes per pound (rounding up to nearest pound). Baste occasionally with milk/brine mixture. For the last half hour to forty five minutes of cooking, remove the top. Cook until meat thermometer inserted into the thickest part of the chicken’s thigh reads 165º (yay, FDA, for lowering the safe internal temperature!). When fully cooked, remove chicken from Dutch oven and cover with tinfoil. Rest 15-20 minutes, which will allow juices to redistribute and result in a tender, juicy bird. Bring a medium pot of lightly salted water to a boil. Drop in carrots and simmer for about 1 minute. Pour through colander and rinse under ice cold water. Drain. In the same pot, heat remaining ingredients over medium-high heat to a boil. Once it boils, reduce heat and simmer for 2 minutes. Remove from heat and add carrots. Cool until room temperature and then place in airtight jars or containers and chill. Let soak 1 day. Will keep for up to four weeks in the refrigerator. I’ve never made a soufflé before. I’m really not a huge fan of measuring ingredients and it just always seemed like they were scary and intimidating and something not really in the realm of possibility for me. 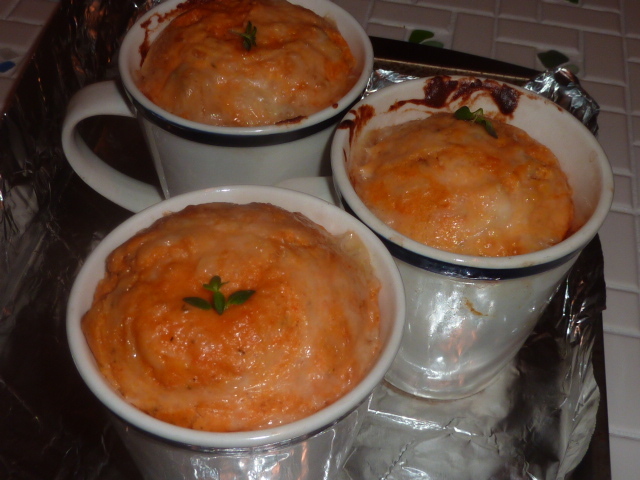 However, I’ve gotten better at measuring things since I started this blog (so, you know, I could actually write a real recipe and replicate it later), and when I came across a recipe for a savory sweet potato soufflé I figured I had to give it a shot. Doubly so because we got several really lovely sweet potatoes in our CSA basket and Zak isn’t the hugest fan. I thought I might have to get creative, so the soufflé seemed like the perfect option. I’m pleased to announce that these turned out light, airy, fluffy and absolutely yummy. I will no longer be afraid of the soufflé. Paired with a simple roast chicken (please read this post for full how-to on how to roast the perfect chicken), this was a really light and flavorful dinner. I’m so happy I added the soufflé to my repertoire, because I can sense a lot of really great variations coming on (in the mean time, I need to get the proper attachment for my food processor to whisk eggs, because my wrist was hurting a little bit after beating the eggs to death by hand). 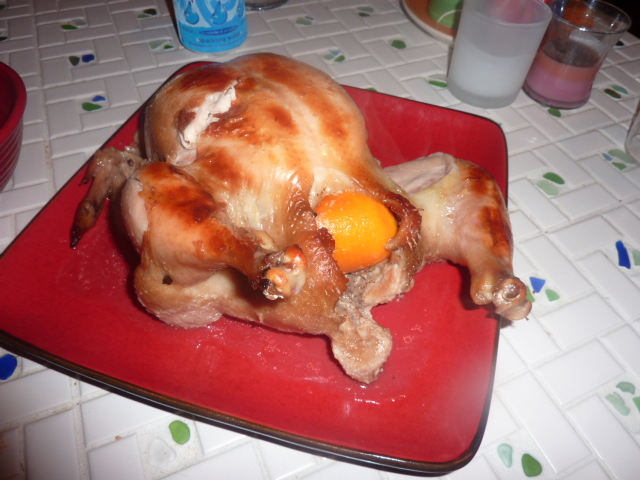 See the picture of the really beautiful and yummy roast chicken after the jump. Remove chicken from brining solution by straining through a colander. Make sure you save all brining ingredients. Dress the chicken with lemon, onions, garlic, radishes, celery, carrots, fresh chives, and peppercorns by shoving deep into the cavity. Season liberally with crushed red pepper flakes pepper and poultry seasonings. Allow the chicken to rest overnight, at least 18 hours. This allows most of the moisture to evaporate from the skin of the chicken, which will result in a crispier skin (my favorite part!). Remove chicken from refrigerator and place on a baking dish on top of a roasting rack. Juice 1/2 lemon over the chicken, using a pastry brush to cover most of the exposed skin if necessary. Place chicken in preheated oven on center rack. Roast at 475° for 15 minutes or until skin is light golden brown. After 15 minutes, reduce heat to 350°. Roast chicken roughly 20 minutes per pound (rounding up to nearest pound), or until meat thermometer inserted into the thickest part of the chicken’s thigh reads 185º. If chicken becomes overly brown, tent with a piece of tinfoil. Preheat oven to 400º. Place sweet potatoes on a tinfoil lined baking sheet. Bake sweet potatoes 30-60 minutes. When done, potatoes will be easily pierced with a fork. Let cool and remove skins. Reduce oven heat to 375º. Transfer insides of sweet potatoes to a food processor. Season with kosher salt, freshly cracked black pepper, and 1 tsp. garlic powder. Butter three 1 1/4 cup cups/ramekins and set aside. In a medium saucepan, melt butter over medium-low heat. Add onion, garlic, and thyme. Check seasonings and season with salt and pepper. Cook, stirring often, until onion is softened and translucent, about 8 minutes. Stir in flour and cook, while stirring, about 3 minutes. Slowly whisk in milk. Simmer, whisking constantly, until thickened, about 2 minutes. Remove from heat and stir in 1/2 cup cheese and 1/2 tsp. salt. Whisk in sweet-potato puree, then egg yolks, one at a time. In a clean mixing bowl, beat egg whites with a pinch of salt until stiff peaks form. Whisk 1/4 of whites into cheese mixture. Gently fold in the rest with a rubber spatula. Place ramekins/cups on a rimmed baking sheet. Pour mixture into ramekins/cups and sprinkle with remaining cheese. Bake 15-20 minutes until puffed and golden brown. Top with a small sprig of fresh thyme.